Flameworking, or lampworking, is the art of manipulating glass using heat from a torch. It is a popular technique for bead making and for sculptural or blown pieces. 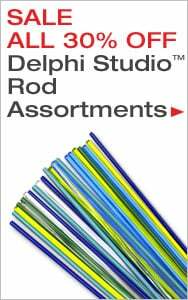 Delphi offers a wide selection of supplies including glass rods, tools, and instructional material - so get fired up with flameworking! Delphi Tip: Don't know where to start? See our Beginning Bead Making section.